How Dad Lit Helped Me Write My Own Fatherhood Story | Use Your Words | Kids VT - small people, big ideas! About a year ago, when my wife, Kate, was eight months pregnant with our first child, my Aunt Diane greeted me at a family Christmas party in Minnesota with a prediction about fatherhood: "You know, when I see you a year from now, you're going to be fat and bald." I knew Aunt Diane only teased, yet I brooded over her words all night. Intimidated by the prospect of parenthood, I had been for weeks trying to prepare myself for the day I would become "Dad." I couldn't stop focusing on the corollaries of this metamorphosis: the diaper explosions, shrieking cries at night, perpetual exhaustion, buying into the Baby Industrial Complex. The thought of losing control of my waist- and hairline deflated me even more, because it spoke to an even greater fear about parenthood: losing my late-night-music-listening-always-traveling-always-writing identity. Kate, stuck back home in Vermont for the holidays, laughed when I told her about Aunt Diane's comment. "All new dads worry about this stuff," she assured me. "You'll figure this fatherhood thing out." But I wasn't convinced. So, as an academic, I did what comes naturally when I need answers: I visited the library, this time to gain insight into the experience of other first-time dads. I stumbled upon a shelf of books that spoke to my apprehension and doubt. They bore soothing titles like Men Can, Fathers are People Too, Rad Dad, A Man in the Making and How Tough Could It Be? Browsing their pages was the literary equivalent of a group of dads commiserating over beers at a party. I later learned some of these books belonged to a flourishing subgenre dubbed "dad lit," a subset of parenting memoirs aimed at Gen-Xers and millennials like me. The formula for the books is relatively simple: Take one thirtysomething man with a creative career, ne'er-do-well tendencies and a patient wife, mix in a positive pregnancy test, and watch him grow from narcissist to model father through events both hilarious and gut-wrenching. Neal Pollack's Alternadad (subtitled "The true story of one family's struggle to raise a cool kid in America!") is emblematic of the genre. Pollack, an eccentric journalist, novelist and punk rocker, begins his journey to fatherhood strident about maintaining his lifestyle — he wonders when he can bring his son Elijah ("the new roommate") to the hip Austin City Limits Music Festival and how he can get away with smoking pot in the house. Writing with a jocular crankiness, Pollack navigates the de rigueur new-dad issues like dirty diapers and playground showdowns with overprotective parents as he and his wife struggle to pay bills, obtain health care and enroll Elijah in a good school. The trajectory of the memoir (dadoir?) follows Pollack's maturation into an unselfish father. He gives up the second day of Austin City Limits to chase down a potty training seat at Target. When his family moves to a sketchy part of town in Austin, Texas, he establishes a homeowners' association to make his new neighborhood safer. At the end of the book, Pollack experiences an epiphany about the balance between his life and his new role, an "understanding that life presents you with limitations and that you have to learn to deal with those limitations and be happy anyway." I wondered if something similar would happen to me. Our daughter, Sage, was born on a cold January night. As we returned home on icy roads the next morning, I drove slowly, completely focused on my role as protector. When we arrived, I cautiously walked up the icy pathway to our house, tightly gripping the car seat, which held my bundled-up daughter. I spent hours just gazing adoringly at her that day, feeling a kind of love and altruism I hadn't sensed was possible before. I was immediately aware of how cliché this seemed — I had read about such moments in dad lit, after all. But the big love I experienced in those first few perfect hours with Sage felt so singular. Indeed, in the ensuing weeks and months I sensed that I was living my own dad-lit story, complete with my own dad-lit moments. I mistook mittens for socks on more than one occasion, demonstrated poor diaper-fastening skills at times and once even locked Sage in the car. But these things haven't defined my experience as I worried they would. They're merely funny stories to tell. 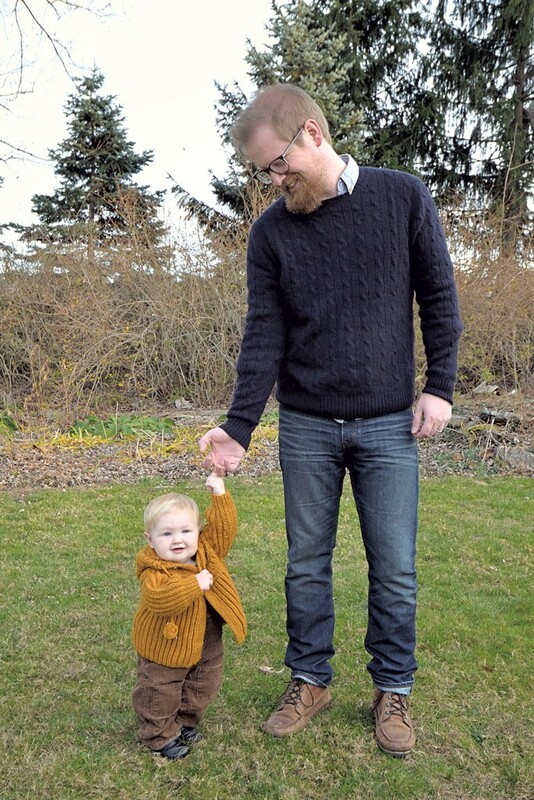 I've gotten over the fear that being a dad would become my single, defining identity. Rather, fatherhood, for me, has become a role marked by addition rather than subtraction. When I listen to records now, Sage joins me and plays with album sleeves on the floor. Kate and I still travel a lot, but even the places we've been before possess a kind of newness as we introduce them to Sage. And, as a writer, I'm driven to produce more because I know my window to work between naps is limited. Like Pollack, I'm learning to strike a balance between my old life and my new role. When I see Aunt Diane again this Christmas, she'll see I haven't gained much weight and my hair is only slightly thinner. When she asks me what it's like being a dad, I'll have a lot to say, good and bad, but mostly good. I'll tell her it's all part of my fatherhood story.